I saw a great idea online a few days ago, so I thought, why don’t we try it this year. 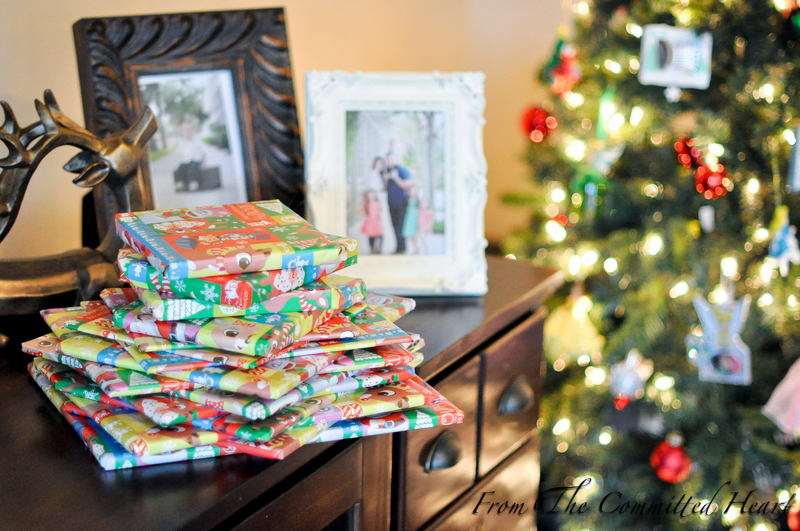 Basically, you pick out 25 Christmas books and you wrap them up. We are wrapping a mixture of books because we don’t have 25 Christmas books. Each night, one of your kids will choose a book to unwrap for the family to read. If the child is old enough, and they would like, they can read it out loud, instead of the parents. We are also going to switch up the times we read our book. Most of the family readings will be at night, around bed time, but other days we will read at breakfast time, around the table. Last but not least, you can make your collection of books, all Christ centered for the Christmas season (which is great), but again we have chosen a mixture, between Jesus’s birth, one or two Santa books, a Mickey Mouse Carol and old favorites. Below is our book list, some are new that I just purchased this year and others I pulled off our bookshelves. So go pop some popcorn, grab a couple of blankets, snuggle up close with the family on the couch, and start a new family Christmas tradition! This entry was posted in Christmas, Parenting and tagged 25 books, Christmas Countdown, New Family Tradition by fromthecommittedheart. Bookmark the permalink.